The restaurant Havelská Koruna focuses on traditional Czech cuisine, which requires special technology and equipment. 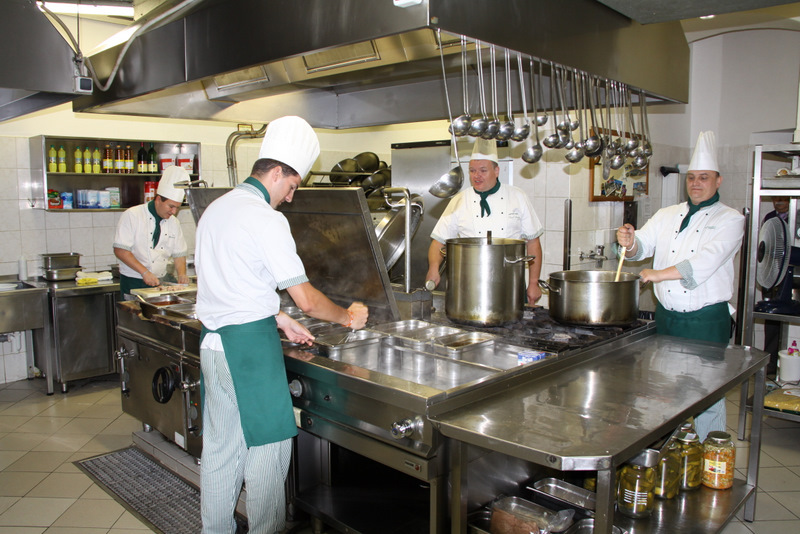 All the dishes are prepared in a great facility that consists of two kitchens for traditional Czech meals, one kitchen for delicatessen and salads and a room for meat processing. A team of seven professional cooks makes sure that meals served are really delicious. In order to meet strict requirements of EU and cook especially sauces according to traditional old recipes, our restaurant is fully equipped with so called food cooling device. What is it? It is a cooling device with high power and it works on a principle of rapid cooling. Every base of sauce is first cooked and then cooled down from +80°C to +5°C. The purpose of this process is to sterilise the sauce which is later put into containers to marinate. Without this device it would be necessary to throw out the sauce after only three hours. Another special device used in our kitchen is oil-water fryer. What is this? Imagine a stainless steel pot with a small screen on the side. There is a solution of water and salt in one third and oil with heating elements in the rest of the pot. Common fryers keep dropping crumbs of frying food to the bottom of the pot and these small crumbs start burning after a while. This process leads to smelly odour of fried food. With the usage of oil-water fryer this negative side effect is prevented. Pieces of crumbs fall down into water solution so its burning is not possible. After a preparation of few dishes, water solution with crumbs and oil is changed with a fresh one. Our restaurant also offers quality filtered water, from which chlorine and lime scale was removed. Preparation of all dishes is based on traditional recipes and techniques such as stock made of bones or vegetable base without any instant ingredients or artificial flavours. Our suppliers are only Czech produces therefore our dishes can be compared to home-made cuisine.